Strong enough to lift a 2t demolition tool to a height of 32m, a 3.34t tool to 28m, or a 5t tool up to 17.4m, its operating weight ranges from 55.2t to 73.4t driven by a Komatsu EU Stage V-compliant engine delivering 270 kW / 362 HP at 1.900rpm, with minimal environmental impact. Now available to order in Ireland, the PC490HRD-11 is said by O’Brien to be ‘a game-changing machine’ that delivers smooth and convenient operation, high precision, great stability and first-class comfort that allows operators to work through the widest possible range of demolition contracts with optimal control and safety. 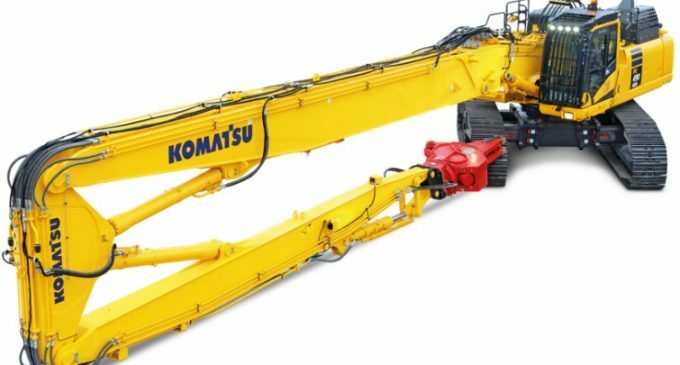 Highly versatile in a number of key respects, it features Komatsu’s own-designed boom change system. Oversized quick connectors for the hydraulic lines minimise back pressure and oil heating without restricting oil flow. Hydraulically powered pins, mounted inside the main boom structure, reduce damage risk. Its working range indication system means the machine can be operated to maximum effect through a full 360 degrees without compromising safety. Optional is a camera system located at the arm end that can display views of the working area to help avoid equipment damage. Ease of transportation – a major consideration with every machine of its size – is taken care of in a number of ways, the effect of which is to reduce its working width of nearly 4m down to below 3m for transportation purposes. Every section of the working equipment comes with tie down points and lifting eyes to allow the equipment to be lifted and safely secured on to a trailer while the machine itself has been kept as compact and light as possible. An optional hydraulically variable undercarriage makes it easy and quick to set up on site. Operator convenience is increased as the front screen wiper and the cab tilt functions can be triggered without the operator taking their hand off the main controls. Other elements amongst its array of features are a full colour cab screen displaying machine limits so operator keeps control at all times, KomVision surround view system, LED working lamps and a neutral gear detection system to help prevent unintended movement of the machine. As with all heavy-duty Komatsu machines, KOMTRAX telematics and Komatsu CARE maintenance support packages apply.